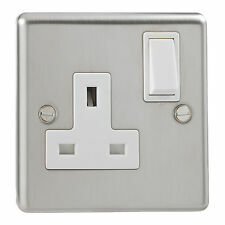 13amp SINGLE SWITCHED SOCKET OUTLET BRUSHED SATIN STAINLESS STEEL Pt.no. Simple rounded edge pattern. weight 180gms. 10X Stainless Steel 13A D.P. 1 Gang Single Switched Socket [ST721-01]. Product: Single / 1 Gang Socket 13A With Switch. Material: Stainless Steel. Baby & Child. Double Pole. ITEM SPECIFICATION. Any unauthorised use or disclosure may be unlawful. Crabtree 4214/3 BG. Complete with back box with knock outs. Boxed quantity of 10. Positive drive action prevents balancing between ON and OFF position. Double pole product marking on moulded rocker to easily identify once product has been installed. The driver will have left a card stating the location of your parcel. Supplied in a Knightsbridge box. Suitable for recess mounting. Switched socket. Stainless lid (not spring loaded). Stainless steel finish with black interior. Minimum mounting board thickness: 14-50mm. Motor Capacitors. Star Delta Starters. Direct On Line Motor Starters. Cable Accessories. 12way PVC Strip Connectors. Junction Boxes. Insulated Cable Glands. Cable Connector Link Boxes. 1x 1 Gang, Stainless Steel Screwless Single Mains Socket. The regulations vary from country to country. 13Amp, 250V AC, Double Pole, BS 1363. FREE Trial ! 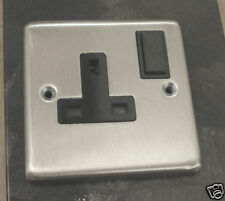 5 NEW KNIGHTBRIDGE BRUSHED FLAT STAINLESS STEEL 20A 1 GANG SWITCHES. Insert Colour: Black. Slim Face Plate - 1.5mm. Distinctive Modern Design. Foam Gasket Protects the plate. Slim 1.5mm. 13amp SINGLE SWITCHED SOCKET OUTLET VICTORIAN BRASS. Plain bevel edged Victorian pattern. weight 170gms. approx size 87 x 87mm. 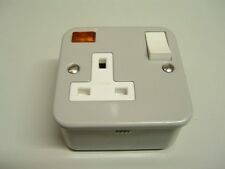 Socket lid is automatically retained in the open position, enabling the plug to be easily inserted. Need Help?. When we notify you of the estimated arrival date you will be able to decide whether or not to proceed with the order. This Modern Gloss designer Socket is part of the new Trendi range, Rocker Light Switch switch. This model features a Gloss black Finish. 1 Gang 15 Amp. Gloss Socket Product Features. High quality plastic face plate, which will not fade. Crabtree 1 gang switched wall socket / plug. White with rounded corners. Made in England, 13A 250V, BS1363. 86mm x 86mm. Studio: Retrotouch. Colour: Black Glass. FOOD & DRINK. AUDIO BOOKS. Orders will be fulfilled by our own warehouse or a 3rd party supplier at our discretion. TEXTBOOKS & EDUCATION. JEWELLERY & WATCHES |. Plate Type: Screwless. Range: Screwless Mocha. Sleek, low-profile screwless faceplate. Finish: Mocha. Function: 1-Gang Double Pole Switched. Switched Poles: Double. Product Type: 13A Socket. Maximum Load: 13A. 13A Single Switched Socket. Single Plug Switched Socket. WHITE Conforms to BS 1363 Red In-use Indicator's Complete with fixing screws. This product is manufactured to the highest quality.